What is vaccine vial monitor? VVM is a small label stuck on the vial of a vaccine which changes color as the vaccine vial is exposed to heat. The color of the VVM central square indicates if the vaccine is safe for use or not. It is a small light purple circle with a white square in the center. The square remains white if there is no exposure to heat. With heat exposure the square begins to darken. It registers the cumulative heat exposure over time. The combined effects of time and temperature cause the inner square of the VVM to darken, gradually and irreversibly. 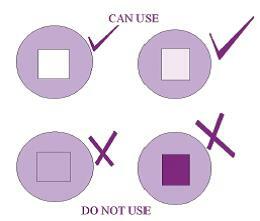 Till the time for which the center square is lighter than the surrounding circle the vaccine is safe for use. As soon as the square becomes the same color as the background or is darker, the heat may have damaged the vaccine and the vial should be discarded. Where on the vaccine vial is VVM located? The location of the VVM on the vaccine vial depends upon the recommendation, whether the vaccine must be discarded at the end of the immunization session in which it is opened, or whether any remaining contents can be retained for use in subsequent sessions. 1. For multi-dose vials containing a vaccine that can be used in subsequent sessions: the VVM is permanently attached to the label of the vaccine vial so that it remains readily observable before, during, and after use, right up to the time when the entire contents of the vial have been used. 2. For vaccines that must be discarded at the end of the session or within 6 hours, whichever comes first: The VVM is attached to the vaccine vial or ampoule and must remain readily observable only until the vial or ampoule is opened, but not observable after opening. For this purpose, the VVM is located on the flip-off top of a vial or on the neck of an ampoule. Are there different types of VVMs? Yes, there are four different types of VVMs for different vaccines depending on their heat stability. bOPV and BCG are the most heat sensitive and Pentavalent and HepB vaccines are the least heat sensitive among the vaccines included under UIP. Why is it important to use vaccine vial monitors? It is important to use VVMs because they help health workers determine whether vaccines have been spoilt by exposure to too much heat. By discarding the vaccine vials which are at risk of becoming impotent, we can be sure that the immunization will be effective. VVM was first used with OPV but is now being used on all the vaccines. Should vaccines with a VVM showing some heat exposure, but not yet at discard point, be handled differently? Yes. These vaccines must be selected for distribution first. The VVM enables the storekeeper to pick out vaccines for use on the basis of most exposed batches rather than "first in, first out".